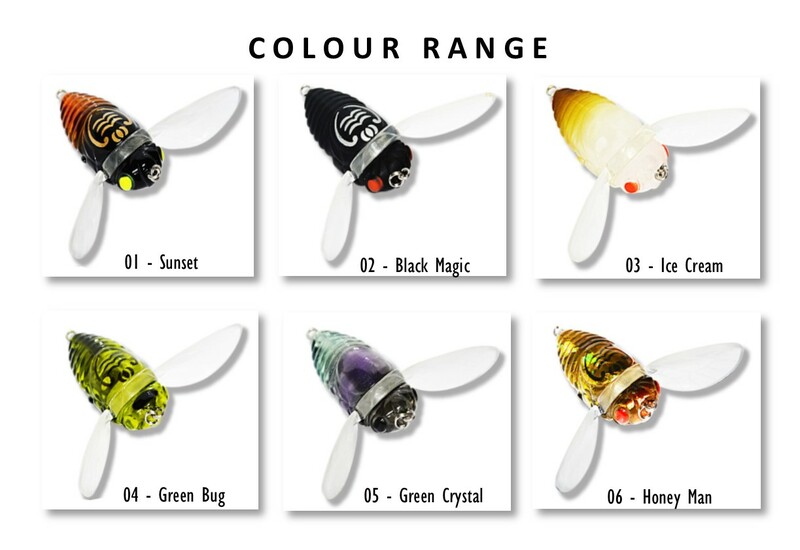 NEW WARLOCK MOTH 40MM GL-07WLM40.. NEW WARLOCK MOTH 40MM GL-07WLM40..
Home / FISHING GEAR / Lures / NEW WARLOCK MOTH 40MM GL-07WLM40..
NEW WARLOCK MOTH 40MM GL-07WLM40.. The NEW Warlock range of top water Moth lures are uniquely designed and are constructed from tough ABS plastic. Unmatched in attraction and originality, the Moth provides a one-of-a-kind top water presence that fish cannot resist. The Moth is fitted with wings that flap and create a noticeable splash and a unique sound that is proven to trigger aggressive strikes. Designed to mimic a struggling insect on the water surface, the Moth is capable of drawing heart-stopping strikes day or night. Hand painted finishes with extra strong VMC Spark Point hooks that allow you to target your favourite species with ease.